A band is subdivided into panels with blue kufic ornamental writing with leaf finials, as well as fine, brown tendrils. At the bottom of the band is a narrow strip with single green leaves or birds. The couching is single thread; the buttonhole is worked over laid threads. This detail shows the repeating design from a late Fatimid embroidered band. For reasons not yet understood, the majority of tiraz textiles dating from the 11th century are tapestry-woven in silk. They are of a very high quality, and some are manufactured so skilfully that the yellow silk shimmers as if the cloth was made of gold thread. These woven examples became increasingly elaborate while calligraphy became less important and in some cases the letter forms became patterns with no meaning. This detail shows the repeating pattern from a 12th century, late Fatimid, band in which the forms are ultimately derived from Arabic characters. The vertical lines dividing areas of pattern into compartments relate back to tall kufic upstrokes and the little spoon-shaped curves along the lower edge are stylised versions of sublinear flourishes of certain letters. Within the smaller compartments S- and reverse S-shapes form patterns. 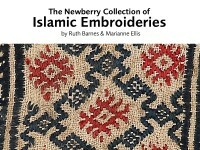 Many of the later embroideries in the collection have band designs divided into compartments and S and Z shapes are frequently included in the designs. The collection in the Victoria and Albert Museum (London) has six fragments embroidered with similar designs suggesting that this is workshop rather than domestic production. The choice of stitches further supports this theory since they are ones that are economical both in time and thread. Possibly the bands decorated items of household linen, such as small towels, since one fragment is a complete width measuring 68 centimetres across from selvedge to selvedge.